The proxy can be considered as a middleman between you and the web server where your desired website is hosted. It receives your request and then sends the request to the web server. The web server(such as google.com) then processes the request and sends back the requested information to the proxy server which then finally sends the requested data back to you. This is similar to you seeking your friend to ask another person a question and then let you know the answer. And just like your friend, the proxy server may or may not disclose your identity to the web server. Depending on this, you can be anonymous on the internet. Among myriad of proxy servers invented for different purposes, the most popularly used proxy type is HTTP proxies. HTTP proxies are great ways to hide your identity online while browsing the web. And, as HTTP connection can interpret data easier than the SOCKS protocol, bots and scrapers perform better with HTTP proxies. In this article, let’s discuss different types of HTTP proxies and how they differ in making you anonymous. What is the HTTP proxy? An HTTP proxy is any proxy server that uses Hyper Text Transfer Protocol (HTTP) to connect to the web server or the client (browser). Due to the widespread use of HTTP on the internet, the majority of the proxies are HTTP proxies. These proxies can access the web pages that you browse on the internet. What is the HTTPS/SSL proxy? SSL or Secure Socket Layer is an additional layer of security imposed on the HTTP to make it HTTPS. This layer adds security certificates that are used for end-to-end encryption to prevent eavesdropping during data transmission. Although HTTP proxies can also access websites that use Secured HTTP (HTTPS), the cost is losing the original SSL Certificate in the process. But a proxy server equipped with SSL establishes a secured connection to the client and also to the web server to avoid any outside intervention. HTTPS Proxies helps you stay safe while making transactions or logging into websites using username and password. The anonymity of a proxy depends on how the proxy server modifies HTTP header packets. While the REMOTE_ADDR is usually added by the browser, there are other header commands that are appended by the proxy server. HTTP_FORWARDED, HTTP_X_FORWARDED_FOR (XFF), HTTP_VIA are some of the headers that are used by proxy servers to indicate if there is a proxy involved. In general format, the HTTP_VIA header adds details whether a proxy server is being used. And HTTP_X_FORWARDED_FOR includes the IP address of the client. Although the X-Forwarded-for is not a standardized header, it is used de-facto by proxy servers with another standardized header comment Forwarded slowly taking over due to its superiority. 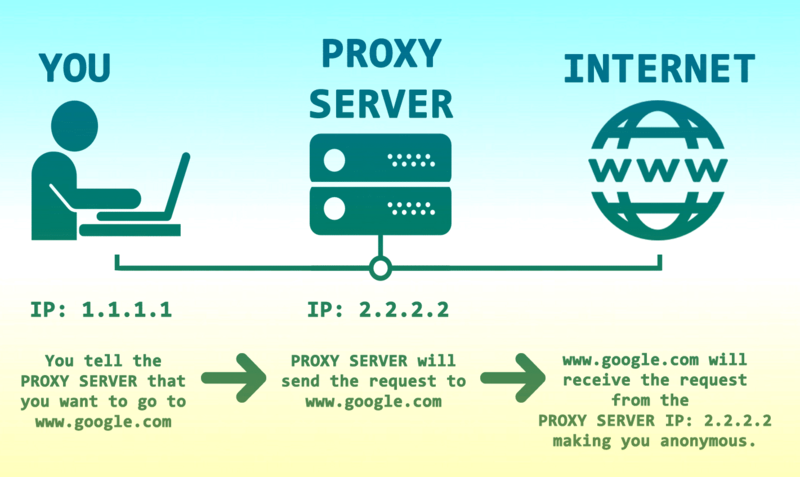 The web server not only know you’re using the proxy Also, But also Know your IP & proxy IP address. Transparent proxies are also termed as intercepting proxy, inline proxy, or forced proxy. These proxies do not modify the requested or responded data, so there is no anonymity involved, and websites can read your IP address in plain text. Since transparent proxies do not modify the HTTP header, the web server does not detect the connection to be a proxy. This is why these proxies are known as transparent proxies. However, the REMOTE_ADDR is also present, which includes your IP address. As this is not removed either, your IP address is exposed to the web servers without any hassle. In most cases, the client is also unaware that there is a proxy in place. However, this type of proxies has some other uses apart from being anonymous. Depending on uses, transparent proxies can be of three types. Gateway proxies: These transparent proxies are usually found in public wifi hotspots to grant access to only those with permission. When you try to get on public wifi and see a login page, it’s because the gateway proxies are placed to prevent any outsiders from accessing. Caching proxies: This type of proxies can cache content on the proxy server to deliver content quickly. Most of the content delivery networks use caching proxies to reduce traffic load and faster connection. ISPs also employ this type of proxies to limit external bandwidth. Filtering proxies: Most workplaces install this type of proxies to prevent employees from accessing social media/streaming websites using the office network. Like all transparent proxies, the transferred data remains unaltered. However, this also gives the system administrator the opportunity to monitor and eavesdrop on the transferred data. Web Server Know You’re using the HTTP proxy, But only know the IP of Proxy! Anonymous proxies modify the HTTP header to replace your IP address with their IP and add additional forwarding commands to prevent the web server from knowing your IP address. The websites can recognize that a proxy server is bypassing the connections but cannot tell your initial IP address since the HTTP_VIA header is present, but the HTTP-X-FORWARDED-FOR is modified with proxy IP. This type of proxy provides bare minimum anonymity and can be of any protocol. Anonymous proxies change the HTTP header information as they are sent along. The resulting HTTP header contains two new header comments HTTP_VIA and HTTP_X_FORWARDED_FOR appended to the already existing REMOTE_ADDR. However, REMOTE_ADDR is replaced with the proxy IP address while the HTTP_VIA includes the IP address of the proxy server. Interestingly, X_FORWARDED_FOR still contains the originating IP address of the client, so it is discernable by the website. However, as this is up to the proxy server to include the x-Forwarded-for header, some proxy services do not include this while others may overwrite this with their proxy IP address, making the client IP address much harder to trace back without proper security measurements. Web Server completely not know you’re using the proxy or not! Elite Anonymous Proxy: Elite anonymous proxies are similar to anonymous proxies, but it is considerably safer since they offer the highest level of anonymity in a proxy. The proxy server modifies the HTTP header to completely remove any of your information and does not add any forwarding commands. This way, the website does not recognize the connection request to be from a proxy server and treats it as any general connection. Elite anonymous proxies are your best bet if you use sneaker or scraping bots to prevent the webservers from knowing that you are using proxies and getting your IP banned. Presently, numerous proxy providers offer elite anonymous HTTP proxies. To learn more about these proxy services and understand which proxy provider works best for you, have a look at our guide to private Proxies. The reviews are done by our expert reviewers to help you find the best suitable proxy service according to your needs.